Are You Asking the Right Questions to Get Customer Experience Right? There is little doubt that marketers have embraced the need for a connected and cohesive customer experience. But while the new customer experience, especially the digital experience, has changed the way most organizations reach and engage with their customers, not all marketers are overjoyed with their current results. In a recent study conducted by the CMO Council and IBM, 38 percent of senior marketers admitted that the new engagement strategies in place have yielded mixed results, with some campaigns yielding expected results while others have not hit the mark. Similar to results being spotty at best, marketers also admit that their goals for delivering a truly connected customer experience have also fallen short as only 6 percent say they have completely connected physical and digital experiences with all touchpoints, connecting and informing the next relevant and valued journey for the customer. In fact 42 percent of respondents indicated that their primary goal for the year ahead was to better connect and integrate loosely tied campaigns into a stronger, more cohesive experience that can actually drive engagement across the customer’s lifecycle with their brand. So with that goal in mind, what needs to actually happen to deliver real customer experience success in 2017? 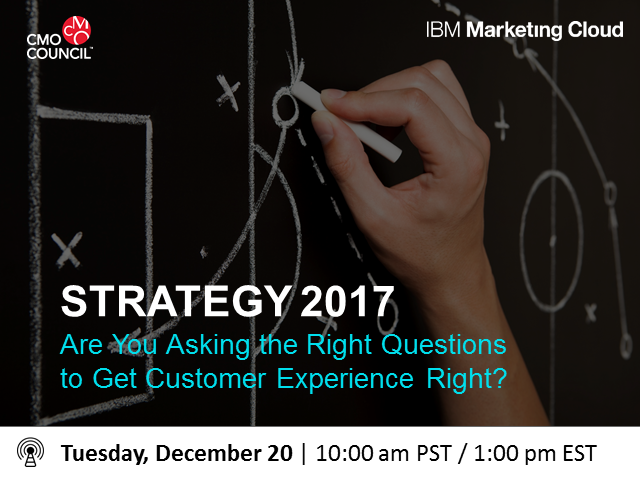 Title: Are You Asking the Right Questions to Get Customer Experience Right?